“This year, owing to the war, it was impossible to have our camp at Robin Hood’s Bay as on former occasions. Mr. Knight and Mr. Sturge therefore spent a Wednesday afternoon hunting round Kirby Moorside, and arranged for a suitable site near Gillamoor in Farndale. We accordingly applied to the military authorities for permission to camp there, but were told that we could not camp east of the main line. Another site was chosen on Widdington Grange Farm, overlooking Linton Weir and the lock. This site, which was lent to us by Mr. Tesseyman, the farmer, had formerly been an old plantation. The advantages of this place were manifold. It was much nearer York than either Robin Hood’s Bay or Farndale, and the equipment could be taken by boat up the river to the place. We lost the bathing in the sea, but we obtained a very good substitute. Round a bend below the camp was a sandy beach, which shelved into the water, forming an ideal bathing place as far as swimming and safety were concerned. See previous posts from September 1914 and January 1915 about the Belgian family that the school supported. “This year “Matric” came late, about the beginning of July, and so the period of reaction and reform was shortened. At this time the Yorkshire farmers were in need of labour, and the boys, hearing of this, immediately volunteered to fill the depleted ranks, and to do what they could to feed the pigs and hoe the turnips of unfortunate agriculturalists. Thus no reaction set in, and the School knew no post-matriculation slacker. The work was undertaken in the following way : six boys, supplied with red handkerchiefs, blue cans, and other attributes of the farm-labourer — corduroy trousers and clay pipes were barred — set out on cycles about eight o’clock, not re-appearing until six. Then, having performed their ablutions, they came to the usual tea, where extra rations were served. As wages they received two shillings a day; of this they saw nothing, as it was handed straight to the treasurer, who in turn passed it on to the Old Scholars’ Wartime Service Fund. The Ambulance Unit has, we fear, been slightly disorganised for a short time by the advance towards Ypres, but the members are continuing their work wherever possible in spite of difficulty and danger, and look forward to wider activity in the near future. We were all very sorry to learn that two members of the party, Donald Allen being one of them, had been rather badly wounded, but the latest reports are good. The Relief Party has been building veritable cities of huts, in which many homeless folk have been able to take refuge. Edmund Yerbury Priestman, Second Lieutenant, 6th York and Lancaster Regiment, fell in action in Gallipoli, November 19th 1915. He was born in Sheffield in 1890 and came to Bootham between 1903 and 1906. “If No Man’s Land is unpromising by day, when it echoes to the rattle of the rifle, it is possibly oven more sinister when, after nightfall, it becomes a silent and menacing sea of shadows, the haunt of the nightbird, seeking who knows what?—and filled with vague rustlings, now and then dispelled by the sharp roar of a chance shot, which rattles and dies away among the echoes of the hills, to leave the land to sombre silence again. Out into this eerie tract of lurking horrors it has been the lot of six, under the alleged “leadership” of the writer of these chronicles, to creep for the purpose of laying barbed wire entanglements to hinder the progress of the agile Turk, should he be tempted to pay calls. Lifting each foot carefully like a stalking burglar, the little party advanced with the stealth of Red Indians, making if anything slightly less noise than a herd of camels, and convinced that every step as it crashed and echoed into the night could be heard in every corner of the Peninsula. He is buried at Hill 10 Cemetery, Turkey. Ellis Reginald Midgley (Bootham 1905-08). Killed in action, November 16th 1915. Second Lieut. Born in Leeds, 1891. He had joined the Leeds “Pals” Battalion on its formation and received a commission in the 2/5th Battalion of the King’s Own Yorkshire Light Infantry six months before his death. Soon after leaving school he became an enthusiastic member of the Leeds Boys’ Rifle Brigade, and in more recent times he was a keen worker for the Y.M.C.A. His “Bene Decessit” speaks of him as archaeologist and football player. He kept both characteristics to the end. His last letter to the Headmaster was from the Colsterdale Camp on some archaeological point; he was secretary of the Northern Foxes F.C., and was no infrequent visitor playing against the School. He left Leeds on October 16th, having married a few weeks earlier. We left Southampton Tuesday morning, October 19th, at 6.30, reached Havre (our base) at 1.30, left Havre 4 p.m. Wednesday, and had about 24 hours in the train. Thursday night we slept at the farm where our transports are, away behind the line 5 or 6 miles. It was there where I first heard the guns. Friday morning we reported, and I was sent out to “C” along a communication trench about a mile long, called “Halifax Road.” The firing line is about three-quarters of a mile in front of us. There was a very furious artillery duel on when I arrived which lasted till dusk; shells of all kinds and sires were dropping around, but none fell really near. The shells did very little damage. Bullets from rifles and machine guns are pretty plentiful, but do very little harm. I have a champion little dug-out, but we are not allowed any kit here, only what we wear and one blanket, so it was jolly cold last night . . . I cannot say where we are, but it is “somewhere in Belgium”.. . I passed through a fair-sized town coming here yesterday, and I don’t think there was one undamaged house; the churches, etc., were in ruins. . . . It is not so bad out here; it is cold at nights and very uncivilised, and after a bit I should think the strain will be a bit of a nuisance, but taking things all round it might be heaps worse. The front line is in an awful state for water, well over knee deep; we all have to wear long rubber boots like fishermen’s waders, right to the top of your legs, to get along at all. Supplies, etc., have to come over the open, bullet-swept ground by night, as the communication trench is waist deep in water and liquid mud, and is impassable except for very small parties without any load. We had no rations sent up for two days; the first day we had breakfast, dinner and tea of bread and butter, tea and jam. We knocked off dinner at night! . . . We never move without our smoke helmets in case of gas, and are never supposed to move singly, always at least two. You might have an extra bath for me; we can’t even get a wash, shave or anything here; it means going about like tramps all the time you are in the front line. I haven’t washed for four days, and have quite a beard now! It is fearfully funny. I must look a sight judging from the others; but we have not a looking-glass fortunately! . . . . We simply yell with laughter when we look at each other. In January I did a talk as part of the Thursday lunchtime recital room series. It was entitled ‘Memories from the Archives’ and I talked about a number of memories from Old Scholars. I’ll share the photographs and text from the talk in several parts on the blog. Read Part 1 here, Part 2 here, Part 3 here, Part 4 here and Part 5 here. 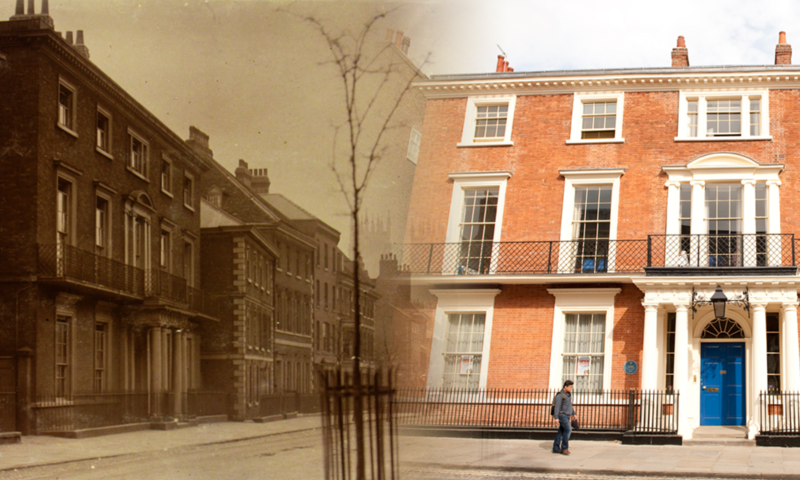 Moving on into the 20th century now, Eric Henry Richardson was at Bootham between 1901 and 1904, during the rebuilding and opening of the new buildings after the fire. He recounts his experiences in the school fire brigade in the 1914 Register. Below are photographs of the fire brigade from 1911, slightly later than Eric’s time, but they give an idea of what the fire brigade looked like. “During my captaincy of the Fire Brigade I had the “privilege” of extinguishing an outbreak of fire in No. 2 bedroom. This was caused by the fusion of an electric light wire melting the adjoining gas pipe and igniting the gas under the floor. The thoughtfulness of Stephenson in turning off the gas meter in some mysterious corner of his “hole”, quenched the outbreak discouragingly soon from the Brigade point of view. One of the masters, realising with great presence of mind that some implement was necessary to tear up the boarding and get to the seat of the trouble, rushed downstairs, obtained a pickaxe from Stephenson (who had already turned off the gas), and proceeded, by excited miss-hits, to do considerable damage to both sound floor boards and mantelpiece jambs. With one bucket of water my Brigade extinguished the smouldering boards, but I have always somehow entertained a sneaking feeling that the honours of the day were with Stephenson. This outbreak occurred at 6.55am, just as the boys were dressing. If the wire had fused 10 minutes later when everyone was in the John Bright Library, the consequences must have been disastrous, and Bootham would have had for a second time to rise Phœnix like from her ashes with greater glory still.”. The programme for the 2015-16 series of Thursday Recital Room events can be found on the school website.